Space station commander Gennady Padalka and cosmonaut Yuri Malenchenko floated out of the Pirs docking compartment Monday and had no problems completing the primary objective of a five-hour 51-minute spacewalk, moving a telescoping space crane to a different module in preparation for arrival of a Russian laboratory compartment late next year. 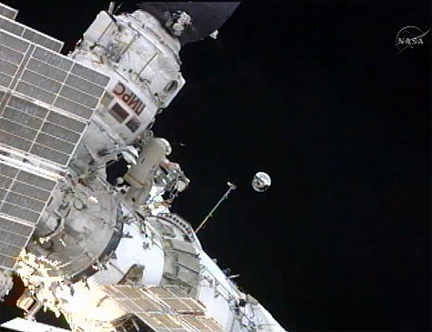 Padalka and Malenchenko returned to the Pirs docking compartment and closed the hatch at 5:28 p.m. EDT (GMT-4) to officially end the excursion. If all goes well, NASA astronaut Sunita Williams and Japanese crewmate Akihiko Hoshide will stage a U.S. spacewalk on Aug. 30. The goals of that outing, the first by a U.S. astronaut since the final shuttle flight last summer, are to replace a critical electrical distribution box and to route cables needed by the Russian laboratory module scheduled for launch late next year. 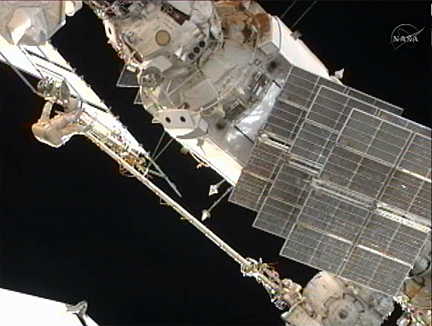 Today's spacewalk began nearly an hour behind schedule because of troubleshooting to track down a small leak. Russian flight controllers, assisted by Hoshide, resolved the problem and the spacewalkers were cleared to proceed with the Pirs depressurization. "Wow. what a beautiful view," one of the cosmonauts marveled at one point as the station approached the western coast of South America. The final major objective of the spacewalk was installing five micrometeoroid shields around the forward section of the Zvezda command module. The cosmonauts had no problems and successfully attached all five panels. 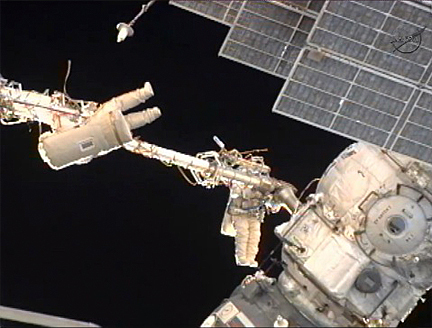 Running well ahead of schedule, they completed two so-called "get-ahead" tasks, attaching two struts to an EVA ladder and retrieving another external experiment.